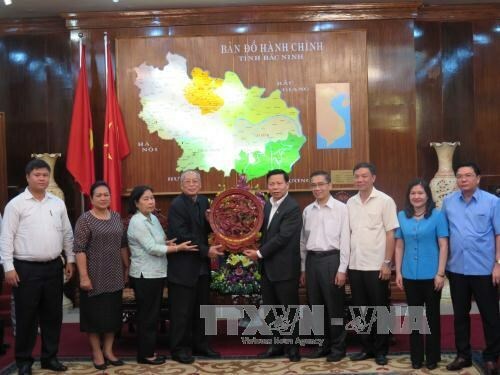 Bac Ninh (VNA) – A delegation of the Cambodian People’s Party (CPP) led by Chairman of the CPP Central Committee’s Inspection Commission Nay Pena visited the northern province of Bac Ninh on August 11 as part of the delegation’s official visit to Vietnam. During talks with secretary of the provincial Party’s Committee Nguyen Nhan Chien and other local senior officials, Nay Pena, who is also First Vice President of the Cambodian Senate, said Cambodia always bears in mind the help and support Vietnam has given to Cambodia during the struggle for national liberation and escape from the Pol Pot genocidal regime, as well as during the cause of national reconciliation, construction and defence. The host pledged that Bac Ninh province will continue making practical contribution to fostering and traditional friendship and comprehensive cooperation between the two nations.